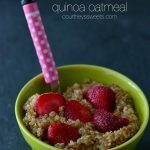 This Quinoa Oatmeal without oats is great for those with FPIES who cannot eat oats due to a rare food allergy or just a great healthy breakfast. In a sauce pan cook the quinoa as you normally would and reserve. In a small bowl mix together the seasoning and mash the banana into the mixture. Fold the quinoa into the banana seasoning mix.